Certifications: View certification info, qualification requirements and study materials. Apply: Submit new, reschedule and recertification applications. Schedule Exams: Schedule a test and learn about exam day. Since 1989, API’s Individual Certification Programs (ICP) have provided the petroleum and petrochemical industries with an independent and unbiased way to evaluate the knowledge and experience of technical and inspection personnel. These certification programs are based on the industry-developed standards that are recognized and used with confidence worldwide. ICP testing, developed in partnership with industry leaders, confirms that certified inspectors and personnel will demonstrate competence in content areas that are relevant to their practices. API’s certifications have come to be regarded as the most demanded and desired credentials in the industry. They provide applicants with means to improve their skills through learning and strengthening their overall job performance. API certified inspectors and personnel are recognized worldwide as professionals who are fully knowledgeable of the relevant industry inspection codes and standards, and who are capable of performing their jobs in accordance with the latest and most acceptable industry inspection practices. API certification allows qualified personnel to establish a career path and make valuable contributions to the safety and quality of industry operations. API will be implementing a price increase beginning on Wednesday, May 1st, 2019. To see which prices are affected, please review this announcement for more information. Testing windows and application deadlines for the 510 and 653 exams for the end of 2019 will be shifted by a few weeks to accommodate the results from the evaluations. Please review the 2019 ICP Exam Schedule for exact dates. Final Results may be delayed and will be posted after statistical analysis and pass point settings are completed for each of these exam administrations. API will be launching a new login system for all ICP candidates called myAPI. Please make sure to use a valid email address as your login since an email verification is required. If you already have an ICP account, this will only affect the way you login to your account and all exam and application information will be retained. The release to the new site is scheduled for 9:30am EST on Monday, December 10th. Refer to the myAPI instructions for login procedures. Please be aware that an API-recognized certification may only be obtained directly through API by taking an API developed exam. These exams are administered only through API's contracted third party exam delivery provider (Prometric), and API does not authorize any other organizations to offer its exams on its behalf. Once you become certified by API, your certificate is globally recognized, and your credentials can be verified in our online ICP directory (www.api.org/icpdirectory). There is no need to apply or register with another organizations' National Registry. If you have any questions about validating a certification, your certification, how to be certified or the API 1169, please contact API's Individual Certification Programs (ICP) by phone (202-682-8064) or by email at Inspector@api.org. ICP is moving to a new exam content delivery system for all computer-based exams beginning with the August 2018 testing window. The new system, Surpass, will enhance the test taking experience for candidates with features like: a more user-friendly interface; increased functionalities; and ease of navigation within the exam. Because of this, the format of the score reports will also change to reflect Surpass's new scoring structure. Please visit the What to Expect on Exam Day section under the CBT Exams tab and the Exam Scoring tab to find out more and to view tutorials of the new system. API will not mail certificates until July 5th in order to accommodate a technical update. Until then, please note that all certified individuals can still print a copy of their certificates by navigating to the Print/Copy option on their certificate line in their main Account page. For any additional questions, please contact Inspector@api.org. API will be adding 15 pretest questions to the 1169 exam beginning with the August 2018 testing window. In total, there will be 115 questions, 100 that are scored and 15 that are not scored. Pretest items will not impact scoring or exam time. Using pretest items are a standard practice and helps determine if new questions are valid, reliable and fair to be used for scoring on future exams. They are currently included in the exam structure for other API exam certifications such the API 510, API 570, and API 653 programs. For more information about pretest questions, please refer to the Pretest FAQs. API will be phasing out its Paper Based Testing (PBT) exams at Special sites. Given upcoming changes to exam content, paper based exams will no longer be possible after December 31, 2018. If you are interested in arranging a PBT before that time, the deadline to submit a request is August 5, 2018. Please note special accommodations may be considered for 50 or more candidates. For any questions, please contact the ICP Exam Coordinator. As of June 1, 2018, API 936 recertification will require a web quiz. The Subcommittee on Refractory Material has requested that each certified 936 refractory personnel be required to take a quiz with each 6 year recertification. API 936 certified personnel will recertify every 3 years as normal, and will be required to take a web quiz every 6 years, similar to the recertification process for the API 510, API 570 and API 653 programs. All certified personnel who have held their certificate for 6 or more years will be prompted within their API account to take the web quiz at the time of their next recertification. To view knowledge that will be covered on the web quiz, please review the 936 Recertification Publications Effectivity Sheet. On March 1st between 5:00am and 12:00pm Eastern Time, we will be updating the 570 recertification quiz questions in myicp.api.org to reflect the new BOKs and Effectivity Sheets. Please refrain from starting your recertification quiz during this time period. Starting with the October 2017 exam window, the total time allotted for candidates to complete the 510, 570, 653, TES, SI, 936, 580, 571, and 577 exams will reduced. Read the full announcement here. Effective immediately, the API Refund Policy for ICP applicants has been updated. Please review the policy prior to submitting refund requests to confirm the eligibility of an applicant to receive a refund. On Thursday, June 15, 2017, between 6:00am and 12:00pm Eastern Time, we will be updating the 653, 570 and 510 recertification quiz questions in myicp.api.org to reflect the new BOKs and Effectivity Sheets. Please refrain from starting your recertfication quizzes during this time period. Effective January 1, 2017 the management of API’s Individual Certification Programs (ICP) has transitioned from Tina Briskin to Andri Orphanides. Please be advised that certificates issued with Tina Briskin’s signature will remain valid until their expiration date. Going forward, certificates and wallet cards for new certifications, recertifications and reprints will bear the signature of Andri Orphanides. While new certificates and wallet cards are being printed, the mailing of certificates is delayed until mid-February. Effective March 28, 2016 API will no longer accept any changes or additions to an application after it has been submitted. Applications that do not meet the minimum requirements or do not contain all the necessary information on employment and education, will be marked as unqualified. API will reject these applications and issue a refund of the application fee minus a $100.00 processing charge. Candidates will then need to submit a new application and pay a full application fee again. API is pleased to announce six new individual certification programs for auditors in the oil and gas industries. These certifications include three levels of proficiency, and each can be obtained in either API Spec Q1 or Spec Q2. ATTENTION all applicants for API 1169 Pipeline Inspector Certification Program. As of 2016 the 1169 examination has been updated to address specific industry-governing documents of Canada. This means that the exam is equally suitable for Canadian inspectors. All applicants will have access to BOTH American and Canadian references, as identified on the effectivity sheet. Applicants can choose to study either set of documentation, and all relevant exam questions will have content that meets both sets of technical requirements. ICP has launched the new SIRE - Source Inspector Rotating Equipment certification program. The first examinations will be held in the December 9-23, 2015 testing window. Effective January 1, 2016 API will no longer offer API and ASME document packages for the API 510, 570 and 653 Inspector Certification exams. API has historically offered exam packages that contain only the pertinent codes and standards needed for the API 510, 570 and 653 examinations. Candidates should continue to refer to the ICP website for the Publications Effectivity Sheets and Body of Knowledge documents, which include information on all codes and standards needed for the examinations. API publications can still be purchased individually from an API Authorized Redistributor. The API SIRE - Source Inspector Rotating Equipment is the newest Source Inspector certification to be developed in cooperation with industry experts. This certification will focus primarily on Rotating Equipment, including but not limited to: pumps, gears, compressors, turbines and associated appurtenances. The first SIRE examination will be held in the December 9-23, 2015 testing window. Check back to find out when applications will be accepted. The program will be open to candidates with any experience in the petroleum and petrochemical industries, as well as those wanting to gain industry experience. Starting with the March 2015 certification exams, ICP will begin providing preliminary scores at the completion of computer-based examinations. After the March trial run, the preliminary scoring will be instituted for all other exams. As most candidates know, API does not finalize the scores until all candidate exam challenges have been reviewed by a committee of subject matter experts. This review frequently results in a change to the scoring process, and that’s why the instant scoring will only yield the preliminary results. The final results will be released 6-8 weeks after the testing window ends. For all other exams either a Preliminary Pass or a Preliminary Fail result will be issued. This preliminary scoring system will help the majority of candidates determine whether they need to submit a reschedule application to take the exam again, and whether to continue their studying efforts. API is now accepting applications for the 1169 Pipeline Inspector certification program. This basic program tests applicant’s core knowledge in relevant codes and standards to perform inspection activities during construction of new onshore pipelines. 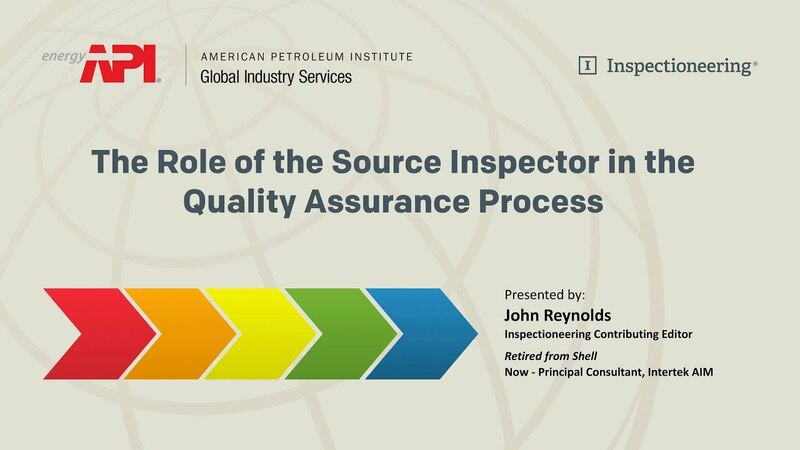 It is open to qualified applicants who are seeking to become certified inspectors in API-1169: Recommended Practice for Basic Inspection Requirements - New Pipeline Construction. This basic program will test applicant’s core knowledge in relevant codes and standards to perform inspection activities during construction of new onshore pipelines. It will be open to qualified applicants who are seeking to become certified inspectors in API-1169: Recommended Practice for Basic Inspection Requirements –New Pipeline Construction. Responding to requests from our candidates, ICP is providing the computer testing tutorial that is given on exam day. Please preview it in order to better prepare yourself for the computer testing experience. Learn test-taking tips and how to maneuver through the exam. Learn how to mark a question so that you can return to it later. Learn how to provide your feedback to the ICP exam committee, and more. The tutorial also addresses the open-book exams, and includes information explaining the use of code book PDFs. On exam day, the PDF information on the tutorial will only be available to those applicants who take an open-book exam (API 510, 570 and 653). Effective May 16, 2014, and based on the new 10th edition of API 510, a National Board certification will no longer be accepted as a substitution for passing the API-510 exam. Effective August 2013 participation in the API ICP Directory is no longer optional. The directory now includes all certified individuals. Each individual will have the option of a privacy setting for partial or full listing. Partial listings will only include your name and a country/state of residence. Full listings will also include your addresses and phone numbers. You can view and make changes to your privacy settings in the new ICP Portal. If you have never logged into the online portal, review instructions here: Apply & Recertify. Candidates applying for API 571, 577 and 580 certification programs are no longer required to hold a current certification in API 510, 570 or 653. Similar to other API certification programs, applicants are required to have experience in the petrochemical industry. Minimum experience required for any ICP certification is based on the applicant’s level of education and experience, as described in the ICP Certifications program details. I’m having trouble logging into my account. What can I do? If you have difficulties logging into your API account, or a problem submitting an application for certification, please contact the ICP Help Desk at ICPHelpDesk@API.org or call 1-877-562-5187. Why isn’t my application accepting an email address for my employment verifier? The ICP Portal will only allow you to add a business email address. Addresses from public domains, such as Gmail, Yahoo, etc. are not accepted. Why was my application marked as Unqualified and what happens next? Before submitting an application, please read the qualification requirements for your selected program. The necessary minimum experience MUST be documented on the application. Applications that do not meet the minimum requirements or do not contain all the necessary information will be marked as unqualified. Candidates will then need to submit a new application and pay a full application fee again. Review the Qualification Requirements for your program. Do I need to take a training course for the test? No, ICP does not require candidates to take a training class to prepare for exams. It is the candidate’s decision to attend training before an ICP examination. API does not endorse test preparation classes, courses or companies. Classes on specific API standards are periodically offered through API-U Training and may be useful to the candidate. Other classes that are part of a certification requirement, such as the Auditor Certifications, are routinely offered through API-U. Questions on ICP examinations are derived from the publications listed in each program's Publications Effectivity Sheet. Additional information and precise topics are included in the program’s Body of Knowledge. These documents, along with other pertinent reference materials, are found on the Exam Info tab for each ICP Certification. Can I schedule my exam with Prometric if I have a deficiency on my application? API may allow you to take an exam while waiting on employment verifications, or copies of a diploma/transcripts. In these instances, an email notification will be sent from API stating the reason(s) that your application is deficient. However, API will not complete your certification or certification renewal until all deficiencies have been cleared. I cannot locate a Prometric testing center near me. There are more than 500 computer testing centers worldwide from which to choose. When selecting a testing location on the Prometric website, it is always best to search by city, not by country. Prometric’s search engine defaults to a 200-mile radius. Try expanding your search as far out as 400 miles, or search using a different city name. If you still cannot locate a testing center, please contact ICPExamCoordinator@api.org. The Prometric website does not show any openings at my preferred testing location. All Prometric​ computer testing centers operate on the first-come-first-served basis. Therefore, API cannot promise that you will be able to obtain a seat at your preferred location. Schedule your exam immediately upon receiving your Exam Authorization Notice email. If seats are not available, please try a different date, or another nearby location. If you still cannot find a seat, please contact the ICP Exam Coordinator. How are ICP exams scored? API utilizes the scaled score method for all exams. Scaled scores are obtained by statically adjusting and converting the total number of correct answers onto a common scale to account for differences in difficulty across different test forms. Using scaled scores enables test results to be reported consistently from one test form to another. The passing scaled score for these exams will differ with each exam period. Each exam has different questions in it, and consequently, different exams will vary in the level and range of difficulty. API uses an industry-standard statistical process called equating to adjust the passing scaled score according to the relative difficulty of the exam form. Thus, the passing scaled score used for each exam always represents the minimum knowledge required and the absolute knowledge standard is held constant. Passing the exam is not affected by any other candidate's performance. Preliminary Not Pass - Additional analysis will be conducted to confirm and finalize your score and determine whether you passed or failed. Please do not reschedule until final results are released. For the API 510, 570, 653, 1169 and TES exams, a set number of questions are designated as pretest. Pretest questions are not scored and will not affect the final score of your exam. You can learn more about Pretest Questions here. For any additional details about scoring, please visit our Exam Scoring section. Examination results are typically released 6-8 weeks after the final day of the testing window. Results are emailed directly from Prometric to the email address that you provided when you scheduled your exam on Prometric’s website. The certification process typically takes 2-4 weeks after exam results are released, at which time a paper certificate and wallet card will be mailed to the “Preferred” address in your API account profile. NOTE: If you pass the exam and your application is showing “Scheduled-Deficient,” API will not certify you until all deficiencies are cleared. Please log into your account in the ICP Portal and select the “Notifications” tab across the top of your account. Review your Deficiency Letter and submit the necessary information so that your certification can be completed. If you have questions, please contact ICP customer service at 202-682-8064, or by email at inspector@api.org. Where do I take my Recertification Web Quiz? The API 510, 570 and 653 inspectors are required to take an on-line, open-book quiz every six years to renew their certification. To take your recertification quiz, or to determine if a quiz is needed for your current certification, log into your account in the ICP Portal. If a web quiz is due, there will be an Alert at the top of your certification page with a link that will take you to the quiz. NOTE: The log in credentials for the web quiz is the same as the login for the ICP Portal. Go to Certifications for additional recertification information for your program, including the Publications Effectivity Sheets for web quizzes.